The April release has arrived! Guitarist, composer, singer, and bandleader Libby Roach and her band Fractal Quintet are a veritable Portland institution, having been a major presence on the scene here and in the broader Pacific Northwest for the last twenty years. “Precipieces” is the debut album by this already deeply established ensemble. Originally from Louisiana, Libby Roach grew up in Ashland, OR and gained traction early on with her punk rock trio Smidgen, who would go on to open for alternative rock legends Primus. 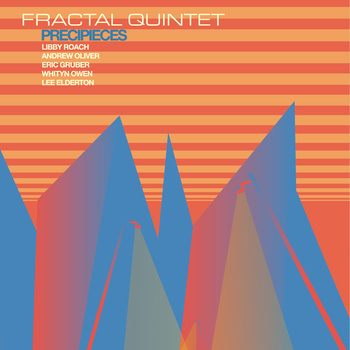 Fractal Quintet has employed a veritable who’s who of Portland jazz and improvising musicians to play Libby’s unique compositions which feature driving grooves and latin rhythms seamlessly blended with mixed and odd meter passages and avant garde influences. “Precipieces” is a stunning debut album from this important and idiosyncratic ensemble.